The DA Girls 17U Black won bronze in Richmond Hill on Saturday February 27th playing in the Girls 18U Open. The day started slowly for the girls in pool play, but one of the highlights, and probably the turning point in building the girl’s confidence for the playoffs, was coming back from a 12 point deficit (11-23), and beating the Barrie Elites. The girls won their first playoff match, against the Pegasus Diggers (25-14, 25-16), which put them into the semifinals. In the semi, the girls came up short against the Aurora Storm Lightning, the tournament favourite and eventual gold winners. However, the girls finished off the day beating the Acts Elite. The girls won the Bronze medal match with two convincing wins (25-16, 25-14). 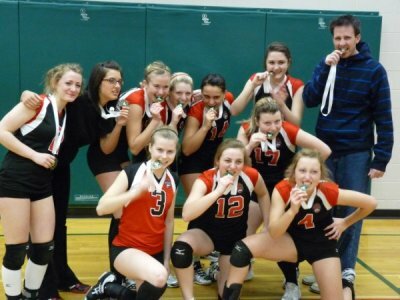 For their win the girls picked up their first medal of the OVA tournament year. Now the girls will attempt to build on their success, next week, with play in the 17U division, scheduled in Peterborough. The DA Girls 17U Black was in Scarborough this past weekend competing in the McGregor Cup Championship East Tournament. The UTSC campus provided a nice close location for the girls to gather up some great fan support, as all of the girls had parents, and many more relatives, attending the matches throughout the day, creating many standing room only situations for viewing. The team is appreciative of the fan support. The girls finished second in the pool defeating DA Red 16U (21-25, 25-23, 15-9) and losing to Scarborough Falcons (17-25, 10-25). The DA Girls swept the pre-quarter final set against the Pegasus Explosion, (25-23, 25-20) and then lost the quarter finals, their fourth match in a row, against the higher-ranked Storm Thunder (14-25, 21-25). The girls had to settle for seventh as they finished the day with losses to the DRVC 16U (21-25, 18-25). The next tournament is on February 6. Preliminary indications are that it will be a trip to Ottawa. The DA Girls 17U Black returned to Kingston last weekend to compete in their first 18U division tournament for the 2009-10 volleyball year. The girls started the day slowly with two losses to Oakville Thunder (20-25, 26-28), but they were able to bounce back with a sweep of games against the Etobicoke Titans (27-25, 25-11). The girls then finished the pool play with losses (12-25, 20-25) to the much taller Northumberland Breakers. Off to the playoffs and the DA Girls were able to sweep the pre-quarter finals against the Pegasus Diggers, (25-18, 25-22) and advanced to the quarter finals against the #1 ranked Ottawa Fusion. The Fusion, (the eventual winners of this Tournament), were just too strong for the DA Girls, who were playing in their fourth straight match, and the DA team went down in two straight games (15-25, 23-25). Unfortunately, the girls were unable to nail down the 5th spot in the tournament, in their next set, as they finished the day with losses to the Oakville Thunder (20-25, 20-25). The girls will be practicing hard this week preparing for their 17U tournament, this upcoming weekend, at UTSC, their second of 4 tournaments in 5 weekends. The DA Girls 17U Black began their OVA season last weekend at the Provincial Cup Championship East tournament in Kingston. This was the first official OVA tournament of 2009-10 for the girls. The girls did participate in a friendly tournament with three other DA teams, back in November, winning four games and losing two games. In Kingston, the girls started the day on a winning note taking the first game with Ottawa Fusion, 25-18. They lost a close second game 24-26. The next match was against Titans Nemesis, and the girls were able to earn another split, with a nice comeback in the second game, (19-25, 26-24), but they needed the sweep to earn first place in the pool. In the pre-quarter finals, the girls were beaten by Maverick Outlaws in two games (19-25, 21-25), and thus the girls were unable to advance to the quarter finals. The girls did finish the day on a positive note by defeating the DA 16U Red in convincing fashion, and ended the day with a respectable 4-4 record. The girls have been working hard under the direction of Curtis, Chris, and Lindsey and are looking forward to the 2010 year. Coached by Curtis Gilfillan, and alumni/veteran OUA liberos Chris Graham (Western) and Lindsey Johnson (Lakehead).